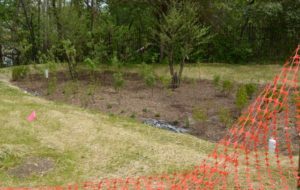 This garden in Washington, D.C’s Ward 7 is designed to slow down and cleanse torrents of sullied water that roars into the Watts Branch, an Anacostia River tributary, during rainstorms. WASHINGTON—Call it the green pulpit of Ward 7. The 25-by-75 foot bowl, flush with native trees, shrubs and flowers, is high above Nannie Helen Burroughs Avenue NE at the edge of an asphalt lane circling the longtime headquarters of the Progressive National Baptist Convention. 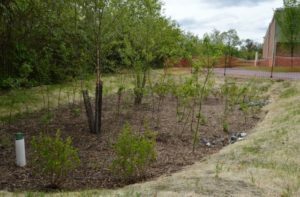 The newly planted garden is the brainchild of the Anacostia Waterfront Trust, a local non-profit charged with amending the dirty water of its namesake river. It’s engineered to slow down and cleanse the sullied torrents that roar into the nearby Watts Branch—a major Anacostia River tributary—during rainstorms large and small. The unique project is the inaugural piece of RainPay, a business venture with a social and environmental mission that the trust hopes will evolve into a network of similar gardens in strategic spots within the Anacostia River drainage. “We’re helping God’s green Earth and providing an income stream for the church,” Doug Siglin, the trust’s executive director, explains in an interview with Renewal News. How can such a garden feed the coffers of religious institutions such as the Progressive National Baptist Convention? It’s a bit complicated. But roots were set four years ago when D.C.’s Department of Energy and Environment incorporated a first-ever stormwater retention credit trading system into a set of new regulations. It mimics other trading systems already in place for renewable energy, greenhouse gases, and air and water quality. The innovative credit spurs compliance with the federal Clean Water Act in outlying D.C. neighborhoods where stormwater and sewer systems are separate. 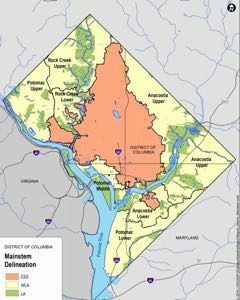 Historically, impervious surfaces in parts of the city distant from downtown and abutting the Anacostia were never retrofitted to be greener because of a lack of money. A Washington, D.C.-based non-profit plans to construct RainPay gardens in the Anacostia River watershed in the yellow area on the lower right side of the map. In a nutshell, the credit allows developers who can’t meet required storm water runoff standards have to buy credits from those who can. One storm water retention credit equals one gallon of runoff retention for one year, according to DDOE. Siglin’s decision to launch RainPay was far from impulsive. A land-lease for the initial garden site means the Baptist Convention receives a guaranteed lease payment. In exchange, the trust assumes the risk of building and maintaining the garden – and also receives the retention credits until the lease expires. But those credits are not nearly enough to bankroll another RainPay garden or land-lease. That’s why the trust is cultivating an array of donors. Building a RainPay garden isn’t as simple as gathering a gaggle of kind-hearted volunteers wielding shovels and green thumbs. It’s a multi-layered and expensive process that involves acquiring appropriate permits, perfecting a design and hiring a builder with engineering and earth-moving expertise. The price tag for the year-in-the-making Baptist Convention garden is $46,000. It was completed in April and a dedication is scheduled for 11 a.m. May 11 at the Baptist Convention site. Ideally, the trust wants to create 20 gardens a year by collaborating with churches and affordable housing complexes. Siglin is trying to negotiate an arrangement with the local Catholic archdiocese. The RainPay program is just one arm of the trust, which was incubated several years ago by the Federal City Council, a group of business and professional leaders who orchestrate civic improvement projects in the nation’s capital. Former D.C. Mayor Tony Williams heads the council. Close to two years ago, the trust incorporated as an independent non-profit with its own board of directors. Its core mission is creating partnerships that improve the Anacostia waterfront. Roughly 40 percent of D.C. is covered with concrete and asphalt, according to DDOE. When rainwater hits a parking lot such as the one at the Baptist Convention headquarters, it washes a nasty soup of ick including oil, gasoline, rust, bacteria, chemicals, trash, and other pollutants into sewer pipes, the Watts Branch and then the Anacostia. It’s estimated that a typical city block of 100,000 square feet produces 125,000 gallons of water in a two-inch rainstorm. The sheer volume of that flow through a pipe can blow out the banks of an urban stream such as Watts Branch. The rain garden at the Progressive National Baptist Convention in Washington, D.C. took a year to plan for, design and build. The RainPay garden and its adjacent berm are designed to mitigate erosion by serving as a temporary holding pen for rainwater that will eventually seep into the ground. 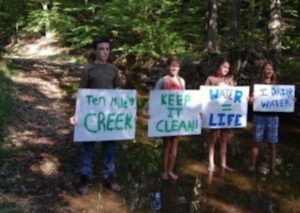 Pollutants are filtered as the water percolates through six feet of amended soil and gravel made more “breathable” by the penetrating roots of river birches, viburnum, river oats and other indigenous species. A nearby parking lot drain also directs water through buried perforated drainpipes. Siglin emphasizes that RainPay gardens are not self-cleaning. The plants need tending and the whole system has to be mucked out regularly to keep them flotsam-free. Long-term, he envisions the trust creating caretaking jobs for local residents.